Statistics, wherever obtainable, show that the proportion of blindness is greater among modern Jews than among their non-Jewish neighbors. Thus, according to Dr. Georg Mayr ("Die Verbreitung der Blindheit, der Taubstummen, des Blödsinns, und des Irrsinns in Bayern," p. 11), in Bavaria the proportion of blindness was as follows: among Protestants (per 10,000), 7.84; among Catholics, 8.27, among Jews, 13.81, the Jews thus showing a rate of blindness about double that of the Protestants. In Bavaria at the censuses of 1840 and 1858 the Protestants also showed relatively the least number of blind; and the Jews again the largest proportion. For Prussia, Dr. Cohn (in Eulenburg, "Real-Encyc. der Gesammt. Heilkunde," iii. 139) presents the following figures for 1880: Among 10,000 Protestants, 8.2; among 10,000 Catholics, 8.4; among 10,000 Jews, 11.0; showing a considerable excess of blindness among the Jews. The same census showed that there was also a larger proportion of congenital blindness among Jews (about 8 per cent) than among non-Jews (only 4.7 per cent). The absolute numbers are given in "Zeit. des Statist. Bureaus fürPreussen," 1882, pp. 190 et seq., and the percentages in a special article by A. Guttstadt in the following year. Blindness is not found very frequently among the Jews of the United States of America, probably because the stringent immigration laws prevent the entrance of defective classes, including the blind. 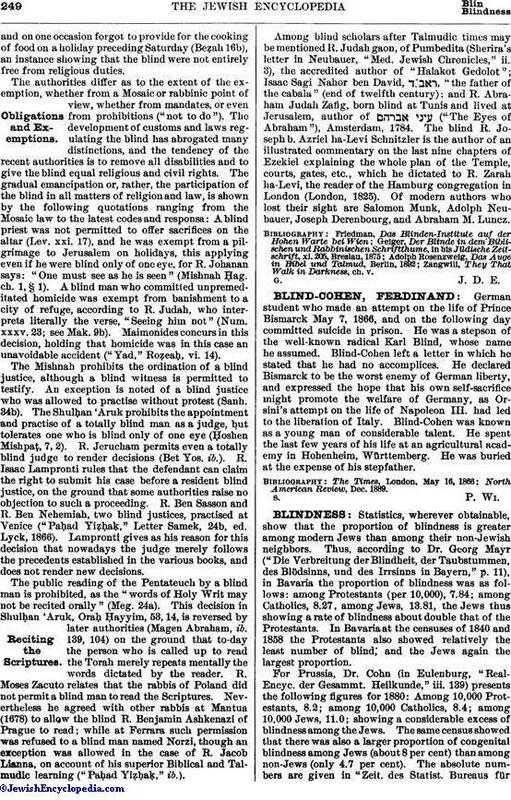 Judging from the etiology of blindness, it might have been expected that the number of blind should be less among Jews than among non-Jews. The most important cause of blindness in the new-born is in from 30 to 50 per cent of cases due to gonorrheal infection from the mother. It is a well-known fact that gonorrhea is comparatively infrequent in Jewish women. This granted, it would be reasonable to expect that Jews would have at least 25 per cent less blindness than non-Jews. To account for the great prevalence of blindness among the Jews, some authors have adduced the greater frequency of consanguineous marriages among them. But all those who have carefully investigated the subject, as G. Darwin Lancry, Huth, Trousseau, and many others, have reached the conclusion that, apart from heredity, consanguinity is not a factor in the production of blindness. 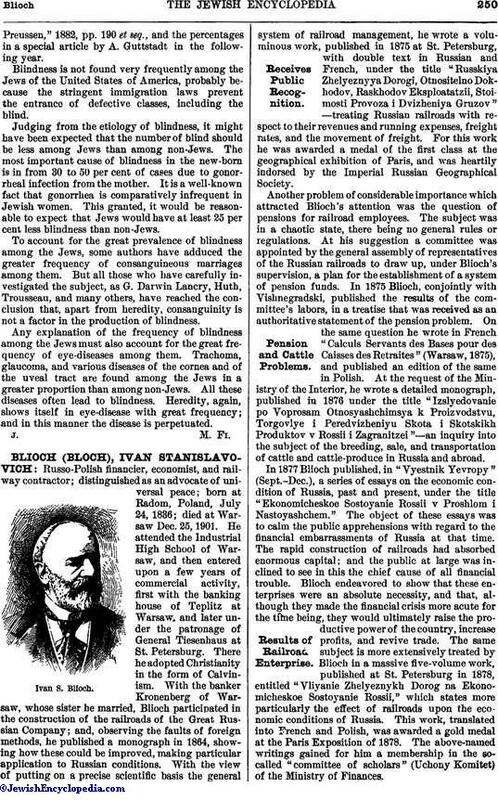 Any explanation of the frequency of blindness among the Jews must also account for the great frequency of eye-diseases among them. Trachoma, glaucoma, and various diseases of the cornea and of the uveal tract are found among the Jews in a greater proportion than among non-Jews. All these diseases often lead to blindness. Heredity, again, shows itself in eye-disease with great frequency; and in this manner the disease is perpetuated.